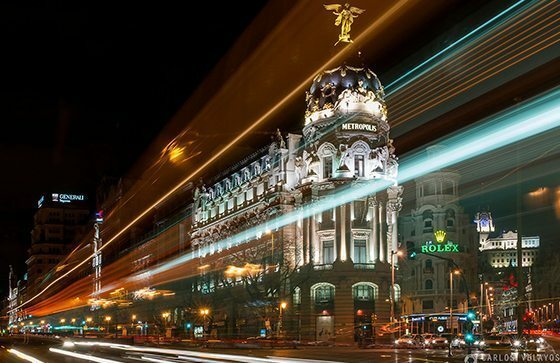 Madrid sightseeing tour includes visiting of the central streets like Alcala and Gran Via, Prado Boulevard. During the excursion you will get acquainted with bullfight history and have a walk around the most prestigious bullfight arena Las Ventas. Also you will have a stop next to Real Madrid club stadium. The first-ever inclined skyscrapers on Castile Square burst upon the eyes. And of course the excursion includes a time for making pictures with Don Quixote, Sancho Pans and Dulcinea. Short stop near the Royal Palace will give you a chance to open slightly the secrets of the Madrid Palace. Then you will walk along ancient quarter, constructed at Gabsburg period of governing. Mayor Square is a former city market where declared royal decrees, took place executions, inquisition and an auto-da-fe, bullfight, knightly tournaments and sacred canonizations also is covered by the route. The symbol of Madrid is sculpture "A bear and a tree strawberry" is located in the Sun Gates Square constructed in the 15th century. Spend some time standing on zero kilometer, visit Saint Anne Square with its small and narrow streets full of different bars and taverns. Here you can taste typical Spanish food. Choosing the excursion you also can visit The Royal Palace and the Museum of Prado. The royal Palace is located in the center of the city and it is an official residence of royal family. The Palace is used for ceremonies conduction. When there are not any activities the palace is open for visitors. Throne, columned and banquet halls are worth of special attention among other numerous rooms of the Palace. Goya, Mengs, Tyepolo, Dzhakvinto masterpieces, tapestries, watches collection, the single in the whole world Stradivari's quartet, royal pharmacy and a weapon collection are available in the Palace. The museum of Prado was open in 1819 during Ferdinand VII’s governing and is known to any art lover. Today the Museum has a huge number of Goya, Velasquez, El Greco, Murilyo, Zurbaran, Titian, Raphael, Bosch masterpieces and it is truly the best museums of the world.